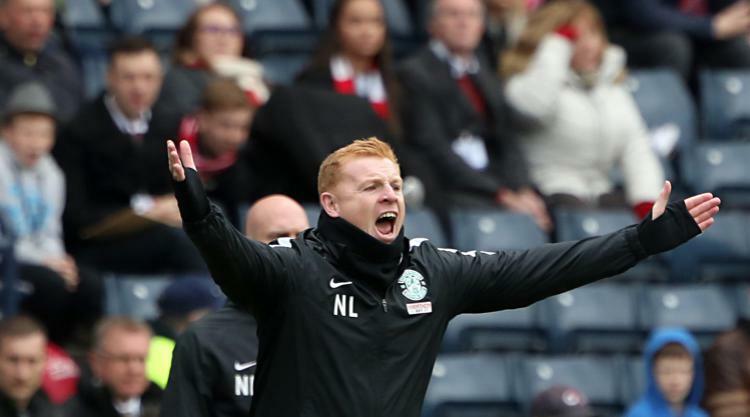 Scathing Neil Lennon tore into his "pathetic" Hibernian players as he told them they only have themselves to blame for losing their grip on the William Hill Scottish Cup. The holders' hopes of reaching a second straight final crumbled as they lost a dramatic semi-final clash to Aberdeen. Incredibly, the Easter Road men found themselves behind at Hampden with just 13 seconds on the clock as they gifted Adam Rooney the opener. And boss Lennon refused to defend the mistakes which eventually cost the newly-crowned Ladbrokes Championship winners a 3-2 defeat and a place in next month's final against either Celtic or Rangers. The Northern Irishman said: "Don't commiserate, it wasn't good enough. "We didn't turn up for 30 minutes then for the next 60 we were the better team by a long way, we scored two wonderful goals. "But you can't give any team a two-goal start in a semi-final. "We got it back, the game could have gone either way but Aberdeen they got a huge slice of luck for their winning goal, it happens. "But my players need to have a good look at themselves. "I don't mind conceding a goal after one minute because you have 89 to get back in. "But we didn't show any responsibility. Two players did, Marvin Bartley and Dylan McGeough. The rest looked like the boy band they've been over the last three or four years. "It was a semi-final, the pitch was good. We have been playing on quagmires all season. But it was pathetic. Utterly pathetic." Hibs kicked-off at the national stadium hoping to set up a repeat of last year's historic cup triumph - their first for 114 years - but within the first few seconds they were behind as Darren McGregor's blunder played in Rooney. It looked like a hiding could be on the cards as Ryan Christie swept home a clever free-kick from the unlikeliest of angles. That forced Lennon to rip up his game plan but the introduction of Grant Holt in place of the obviously annoyed Fraser Fyvie before the break swung the tie back in his side's favour. Holt headed home a lifeline within moments of coming on before setting up midfielder McGeough for the equaliser on the hour mark. However, when Jonny Hayes' defected strike bounced up off McGregor and into the net with four minutes remaining, Hibs' hopes were crushed. "It takes a 36-year-old to come on and change the game for us," raged Lennon, who revealed defender Efe Ambrose played on despite suffering a mysterious allergic reaction during the match. "I thought Holt was brilliant. "We get back to 2-2 but it's not our day because they got a huge slice of luck for the goal. But I still think Darren could have done better for the third goal too." Keeper Ofir Marciano almost made up for his fault at Christie's goal when he came up for a stoppage-time corner but saw his header saved by opposite number Joe Lewis. "Coulda, woulda shoulda," said Lennon after that close-call was mentioned post-match. "Gallant losers are losers. Forget it. You all know me, I am not interested. He's headed it and someone should have got across the keeper to get a touch." Asked about Fyvie's angry reaction to being subbed, he said: "He got thrown under the bus by the rest. I had to sacrifice somebody. It could have been four or five of them, it just happened to be Fraser, so the rest owe him a huge apology." It is Aberdeen who now progress to their second final of the season and boss Derek McInnes reckons that is the least his side deserve. "We got a break with the winning goal," conceded the Pittodrie boss. "If you're a Hibs supporter then it's such a cruel way to lose a semi-final but we'll take it. Our players worked so hard and I want them to be rewarded for what they give us. "I'm absolutely delighted. Like every single Aberdeen supporter I was put through the wringer. "Questions were being asked about us at 2-2. We had to make sure we got our act together. But I thought our experience showed at that point. We might have lost that type of game a couple of years ago. "We've been involved in five semi-finals and won three. The two we lost - against St Johnstone at Ibrox and Dundee United here - I thought we were in charge of the game. We didn't get what we deserved on those days. "But the experience we had helped us deal with getting the job done."